Please allow approximately 4-6 weeks for delivery on this special order. Or as low as $111.75 per month over 12 months. Apply Now. 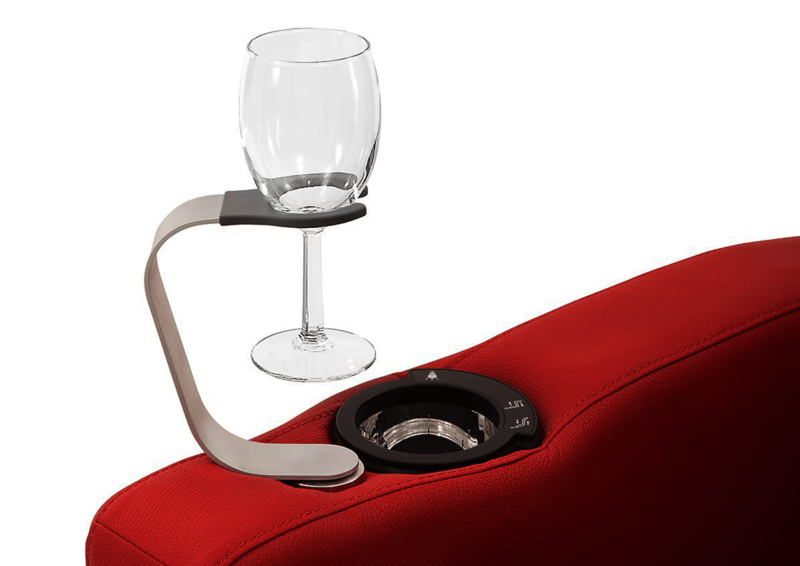 To use the Palliser Wine Holder Accessory simply slide the cylinder post into the grommet located in front of the cup holders on the theater seats. The handle offers a gentle curved design that fits most wine glasses securely and safely. The aluminum arm rotates a complete 360 degrees, is extremely stable, and is easy to clean and maintain with just a wipe of a damp cloth. Note that this table is for Palliser branded furniture only, and is not to be used on furniture of other brands. In order to use this table, your Palliser furniture must have a factory installed grommet that is typically located in front of the cup holders. Please contact a sales representative if you are unsure. A leader in Home Theater Seating, Palliser Furniture is a North American furniture company with local manufacturing facilities in Canada. They have maintained a tradition of excellence for over 60 years. Their Collections reflect a carefully considered selection of pieces that represent quality, feature extensive choice and impart innovation. – Constructed with premium brushed aluminum in an elegant silver finish. Palliser Canada 1 Year Limited Warranty.